I'm just now getting a chance to write an update. Last night the boys and I were very busy mowing, cooking, and relaxing. We saw an awesome sunset last night. 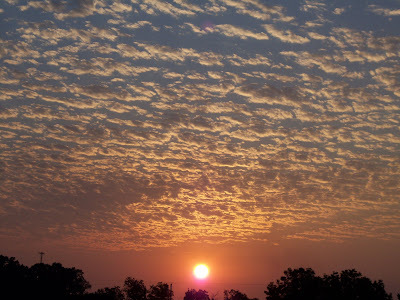 ABC 33/40 Chief Meteorologist James Spann posted pictures that I took of the sunset here. The main weather word in Alabama for the next few days will be 'hot". Temperatures in North and Central Alabama are expected to be in the 95 to 100 degree range with high humidity values. Raindrops will be few and far between through midweek as well. This is very typical for the first week in August in Alabama. Thursday evening was stormy with some scattered very heavy rainfall totals. There were several reports of tree and power line damage in scattered locations throughout the northern half of the state. One of the biggest storms of the day was in my rear view mirror travelling south through Morgan County on I-65. 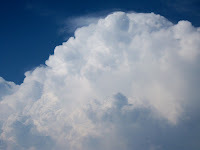 As I was leaving work I photographed a very healthy building cumulonimbus tower. I was in Decatur looking north into Limestone County. By the time I made it out to I-65, the tower had grown into a severe thunderstorm in Limestone. 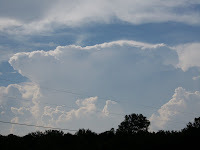 I pulled off the road and took another picture of a tower developing on the southwestern flank of the original storm over northeast Lawrence County. Jason Simpson of ABC 33/40 posted a few of those pictures here. very nice end to the day! nice pic! Wow, Mike! That first one blew my socks off! Terrific shot!